Hi friends, this post is continuation of my previous post. Thank you. Initially, printed materials were made available to workmen on local language and banners were displayed all over the plant about 5 ‘S’ and its benefits along with lectures by both external as well as internal trainers. 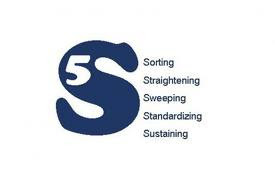 Since success of 5 ‘S’ concept depends entirely on team spirit, various teams were formed at different levels involving both staff and workmen. As teams started meetings, large quantities of unwanted materials, non value adding activities and underutilized spaces were identified and eliminated. As per the concept “place for everything and everything in its place” places were fixed to equipments, labeled with necessary information and one point lesson to handle it. With the elimination of all types of waste, work places in each and every department became well organized which resulted in reduction in breakdowns and accidents. Elimination of non value adding process created opportunity to reduce workmen and staff positions. Teams were encouraged to come out with kaizens(small improvements) some of which resulted in substantial financial savings. Financial benefits derived from all the above activities were spent for atomization which again paved the way for further man hour reduction. In the mean time, minor issues related to quality were addressed without much effort because of the new culture and concepts like “cleaning is inspection”, “first time right every time right” etc. Dynamic work environment helped us to improve product quality where as ‘why why” analysis of a problem took us to the root cause of the problem. With regular brain storming by WCM teams, chemical consumptions were optimized which ended with financial benefit and improved process parameters. Ultimate goal of WCM is to delight the customer and he will be delighted only if we supply him defect free, best quality product at lowest possible price. Successful implementation of WCM and making it as our way of life has strengthened all aspects of our business and I hope with little bit extra effort we can be our customer’s first choice. Some of the most common methods of mounting a bathtub faucet are tub or bathroom wall mounted , deck mounted, and freestanding supply. The method you decide on can depend upon the faucet drilling orientation of your bathtub. Thanks for the info. All the best in being your customers first choice .